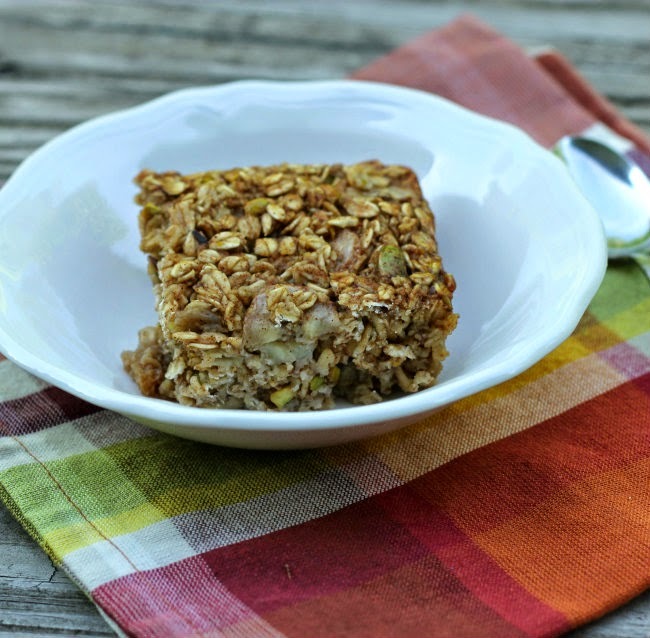 You will never look at breakfast the same way after you taste this baked banana oatmeal! I had a couple of bananas sitting on the counter that were getting way over ripe. When it comes to eating bananas I like eating them when they are ripe, but when they get too many brown spots on them that is where I draw the line… I just don’t care for the flavor. I hate throwing away fruit; it cost way too much for it to end up in the trash. These bananas got me thinking of baked oats and bananas. I haven’t made baked oatmeal for a while and I needed a change from my cold cereal regime. I have made several baked oats recipes, so I just changed my basic recipe up a little to accommodate this overripe fruit. 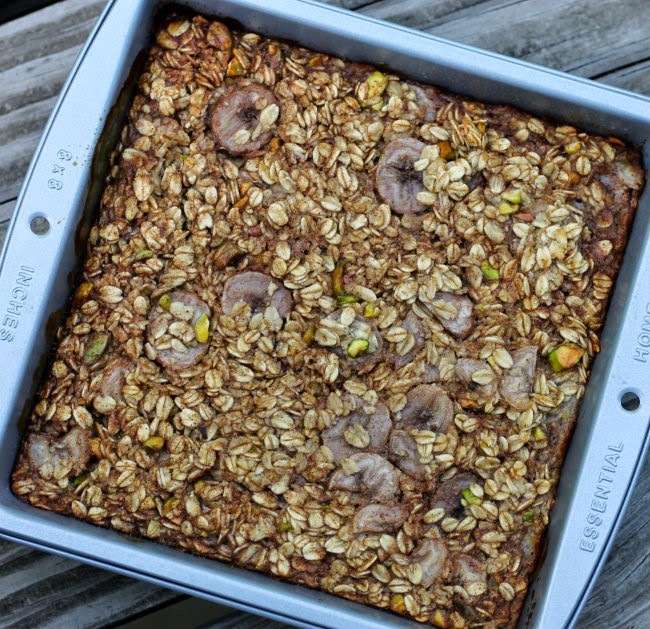 Bananas and oats sound like some kind of nuts need to be involved in this recipe. I decided to skip the traditional nuts… walnut and pecan and decided to use pistachios. Baked banana oatmeal has turned out to be one of favorite oats recipes so far. I love the bananas, cinnamon, and pistachios, they all come together to make one heck of a breakfast. You may feel a little guilty, because it taste more like dessert than breakfast. It is great heated up and served with milk or you can eat it cold on the run either way you will love it. 3. In another small bowl add eggs and beat slightly. To the eggs add the milk and sliced bananas and mix. 4. Add the wet ingredients to the dry and mix until blended. 5. Pour into a lightly greased 8 by 8 pan. Place in the preheated oven for 35 minutes. 6. Store leftovers in the refrigerator. I love pistachios but never would have thought to put them in oatmeal. Great idea. 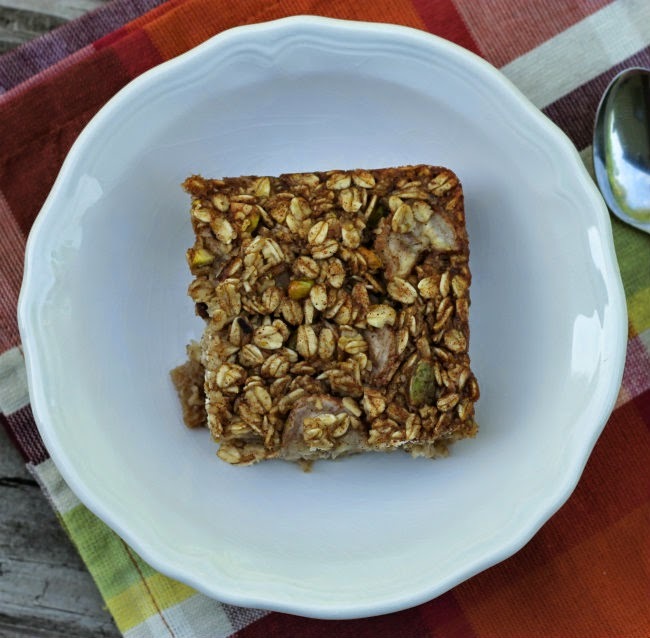 I love how many ways you can change up baked oatmeal so that it is different every time. Bananas and pistachio sound like a great combo!